Gyalton Rinpoche from Palpung Sherabling will be teaching at Karma Ling on the above dates. To cover the considerable cost of this event we will be suggesting a donation for participants but attendance does not depend on a contribution. Gyalton Rinpoche is one of the incarnated lamas of Palpung Sherab Ling Monastic Seat. Gyalton Rinpoche is an incarnation of the religious head of Chungpo monastery in Kham, Tibet. The previous incarnation, Urgyen Jigme Chokyi Senghe, was born in Chungpo Gyalton valley in 1908. From an early age on he pursued studies of Tibetan Buddhism, reading and writing. He was one of the principal disciples of The 11th Chamgon Kenting Tai Situ Rinpoche, Pema Wangchug Gyalpo and of Dzongsar Khyentse Chokyi Lodro. The 16th Gyalwang Karmapa awarded him the title of Khenchen of Kagyu lineage for his high attainment and learning while Rinpoche was in Tsurphu monastery in Tibet. Even Dzongsar Khyentse Rinpoche and Choling Rinpoche awarded him with this title. During The 16th Gyalwang Karmapa‘s pilgrimage to holy places to India in 1956, Gyalton Rinpoche accompanied him and remained in Sikkim. Ath the request of the Chogyal of Sikkim, Rinpoche was appointed spiritual guru to the Sikkimese king by The 16th Gyalwang Karmapa. He was also one of the teachers of the 12th Chamgon Kenting Tai Situ Rinpoche, along with Thrangu Rinpoche, Kalu Rinpoche and the previous Sangye Nyenpa Rinpoche. Gyalton Rinpoche remained in the Royal Palace monastery, continuing the daily routine and awaiting his reincarnation. The present, 7th incarnation, Karma Palden Lungtok Thrinley Rabgye, was born in Sikkim, recognised in 1983 by The 12th Chamgon Kenting Tai Situ Rinpoche and consequently enthroned by Situ Rinpoche at Rumtek monastery. In 1989 Gyalton Rinpoche came to Palpung Sherab Ling for the first time, remaining there for two years. He then went to a regular English medium school and university for about ten years and took up science as his main stream. During that time, Rinpoche learnt different languages such as English, Hindi and Nepali. 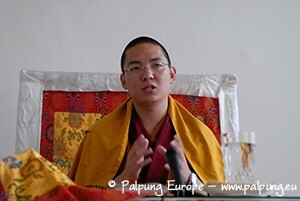 In 2002, Rinpoche returned to Palpung Sherab Ling and was appointed Dorje Lopon until 2006. In 2007 he entered the shedra at Palpung Sherab Ling and started with the given curriculum to then be the director of the new primary school project at Palpung Sherab Ling and later undertook the traditional three-year’s retreat at the monastery’s retreat center. Now Rinpoche has taken up various responsibilities at Palpung Sherab Ling Monastic Seat.